C.N. van Goor was one of the leading Rotterdam architects at the turn of the century. His realized work included buildings for the old zoological gardens (Oude Diergaarde) and, with Verheul, the colossal office building for Stokvis on Westzeedijk. This private house was built for A.I. 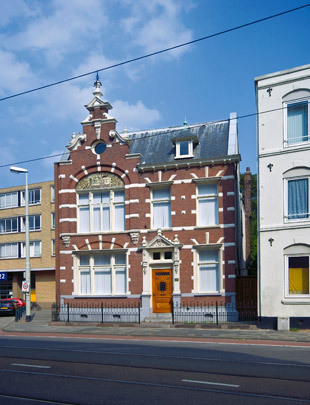 de Vries, a buyer of intestines, who wished to live near the slaughterhouse (now demolished). It is a fine example of Neo-Renaissance architecture in its asymmetrical layout and alternation of brick and stone. A tile picture hovers high in the facade.